Idea for support of Rockets and Helicopters With landing support in Ground troops and carrier. Allied and German Helicopter with landing gear in Ground Troop and Aircraft Carrier. Erik: Thank you one error of mine when posting, greetings. So you're upset that the devs have not decided to do anything despite you spamming requests on practically every thread you post on? BiteNibbleChomp: No, I only put icons that do not work and are in the path of the last ones. There are icons that work and others that's not why I put it. Topic: Order of Battle: Kriegsmarine - Don't miss the Twitch! 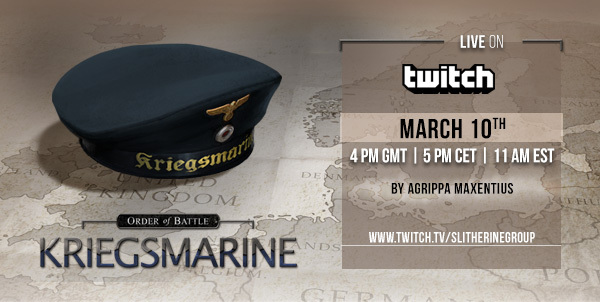 Re: Order of Battle: Kriegsmarine - Don't miss the Twitch! Don't miss an amazing Twitch Stream tomorrow, on Friday March 10th, at 5 pm CET / 4 pm GMT / 11 am EST!